Dermal Repair is an exclusive multi-vitamin facial treatment that contains an essential amount of Vitamin C that helps the skin regain tone, moisture, silkiness and radiance. The Dermal Repair serum can be used as a protective treatment for all types of environmentally damaged skin or as a make-up primer. TO BE 1 OF 3 LUCKY WINNERS OF THIS PRODUCT, PLEASE LEAVE A COMMENT BELOW TELLING US WHY YOU WOULD LIKE TO ADD THIS PRODUCT TO YOUR SKIN CARE COLLECTION. The key factor, when improving and preventing environmentally stressed skin, is to ensure that you are getting anti-oxidant protection from your skincare products. Anti-oxidants protect against the free-radicals that actively breaks down collagen and elastin fibres within the skin. 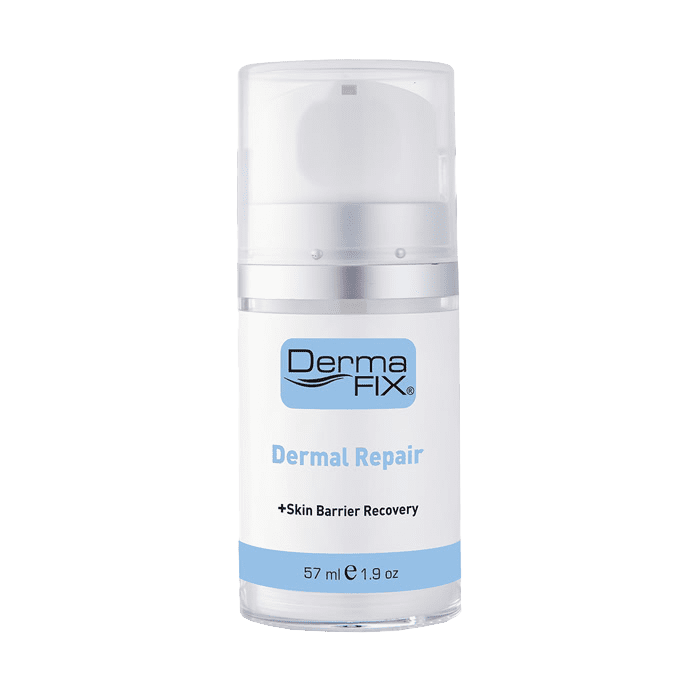 A key ingredient used in the DermaFix Product Range is Vitamin C, a highly effective anti-oxidant that is capable of creating heightened electron exchanges, and in so doing, raising the level of vitality in the cells and tissues. Vitamin C increases cellular exchange and stimulates cell metabolism. DermaFix Vitamin C Serum should be topically applied before using other various facial products, in the prevention of premature ageing in the skin. Vitamin C Serum is an important factor in the healing process, as it stimulates the skin’s fibroblast cells, in order to produce new collagen and combat environmentally stressed skin. Know your skin type? Done our skin quiz? At this time of the year, pigmented, wrinkled & dry skin in winter is extremely difficult to deal with. Skin may feel tight, rough to the touch and sensitive, especially in drying environmental conditions or in a low humidity environment. Indoor heating also causes dehydration, making dry skin in winter worse. A humidifier can, however, be of some help to appease these environmental conditions. I have been using Dermafix products for more than 2 years.. I had very bad acne, then I decided to got see a dermatologist who also happens to be a Dermafix distributor. She introduced me to the products and they have been doing wonders since. I’ve never looked back and I refer every one I know to the Dermafix products. My skin tends to get dry and flaky in cold weather conditions, I need Dermal Repair to help with this and keep my skin moist, silky, radiant and even toned. Thank you in advance. Hi Andy, we are thrilled to hear that you have been using DermaFix and that is has worked so well for your skin. Good luck with the entry! Hello Uduak, thank you for using the DermaFix range and we have no doubt that you will soon start seeing results. We wish you all the best with your entry in the competition. My skin siffered throughout my pregnancy and I haven’t been able to find anything that can help restore moisture and “life” back into my sad skin. Dermal repair was recommended to me to restore brightness and to help tone my skin. I would love to see the results Dermal Repair can offer. If it works you’ll have a loyal customer for life! Hi Annemarie, we are sorry you have not been able to find something that works for you throughout your pregnancy. We are holding thumbs that you get to experience our Dermal Repair. Good luck with the entry! Oh Dermafix- you guys really do make great products!! (Love your Skin ResQ and Dermal Polish by the way!). I’d LOVE love love to give this product a test run! I’m out running and cycling 5 times a week in the wind, rain and sun; then it’s the aircon in the car- and not to mention air pollution– and, dare I say it… hitting 48!! Shucks I just can’t seem to keep up with the extra nourishment my poor face needs… this product would be an awesome addition to my daily regimen. Fingers crossed! Hi Strawberry Pie! Wow, your body and skin really is exposed. We are convinced our range of products will make a big difference so good luck with the entry! If I had all the money I would buy most of your products cause my skin needs some constant glow. I have a problematic skin, and being constant with my skin routine is very important. My skin is breaking again, it’s my 3rd time on Roaccutane, now my daily dosage is 40mg. I have big pimples and so many dark marks. Using your products help with making my skin lighter. But I still have pigmentation. I believe winning this product will help me deal with the dark spots and pigmentation. Hello Katlego, we are sorry to hear about your ongoing skin issues and we really hope you can find a solution with the correct skin care range and products. we are holding thumbs for you. Good luck with the entry! I am really struggling to get my skin under control and already seeing a change with the winter on its way. I was recently referred to use Dermafix skincare and this would be a super boost in helping me get on the right track. I have been battling with my skin from a young age and we have rosacea in the family, so my face always feels inflamed, swollen and red. Looking forward to give Dermafix a try and get back on track and ready for winter. Hi Kimwasawi, we are glad to hear you were recommended to use the DermaFix range of products as we have seen incredible results from so many of our clients. We wish you all the best with your entry to get you started on the DermaFix range. I’ve read and researched so much about dermafix as I was recommended the product by a doctor. Haven’t had the chance to try it yet but holding thumbs I win the competition as it’s exactly what I need for the winter months to keep my skin moisturized and take away the dull look. Hello CB, great news on the DR referral! Our products really do deliver incredible results. Good luck with the entry and hopefully this can be your entry into the DermaFix range of products. My skin really suffers during Winter. It gets so dry and dull. Would love to try something to keep my skin in better shape during the Winter months. Hello Linda, we are holding thumbs that your entry goes well to give your skin a boost during the coming winter months. I began using Dermafix in 2018 to help with acne and pigmentation. I can honestly say that it’s the best thing i ever did for my skin. March and April are harsh on my skin. As the weather turns it feels dry and tight, even with products that made it feel good in summer. I’d love to try Dermal Repair to give my skin the extra nourishment it needs. Thank you Dermafix – your products are amazing. Hello Farooz, we are absolutely thrilled to hear how the DermaFix range of products has helped with your skin care concerns. We completely relate to the harshness of winter weather on the skin and wish you well with your entry! I’ve been using DermaFix for about 3 years and has never looked back. My main concern is was uneven skin tone and it has improve amazingly. I haven’t tried the dermal repair yet and is very excited to add it to my skincare routine to have more “winter ready” and radiant skin. Hi Deone, thank you very much for your loyalty over the years. We are thrilled to hear how well our range of products has worked for your skin. Good luck with the entry! Leading the active lifestyle that I do, being outdoors most of the day, I am looking forward to incorporaring Dermal Repair into my skincare routine to ward off the damaging effects of the sun and help regenerate my skin during the harsh months to come. Winters in Standerton can get pretty severe and Dermal Repair would be just the thing I would need to hydrate, repair and protect my skin! Wow, Naadira, thank you for your kind words and we are so happy to hear how well DermaFix has worked for your skin. Environmentally stressed skin needs all the nourishment it needs to stay healthy, and our Dermal Repair is a great contributor to restoring that healthy balance. We will you all the best with your entry into the competition! Hi Carol, we are sorry to hear about the tough time your skin is having. We wish you all the best with your entry and hope you get to try our Dermal Repair to help restore skin health. I started using Dermafix products about a year ago. I think it’s real value for money. You get an effective product that doesn’t cost you an arm or leg. It helped clear my skin and give a glow. I recently gave birth to my baby girl. During the last trimester I developed urticaria all over and developed some scarring. My skin is in desperate need of repair post partum. Hope this product can help. Hello trish, thank you for your feedback and we are thrilled to hear that you find value in our products. We are also sorry to hear about your skin care concern. We are holding thumbs for you and hope your entry rewards you with the opportunity to have some healing. I am 60 years old and live by the coast where I spend a lot of my time outdoors. With my dermafix products I honestly get a lot of compliments and to other people “I look 40” Great products!! Hi Amalia, it is great that you get to spend so much time outdoors but it does take its toll on the skin. We are really impressed that you are getting such amazing comments and we are thrilled to be part of healthy complexion. We wish you all the best with your entry. I have recently registered with Dermafix and was so please with the instant response received on my skin care concerns. I have been using the products for 2 weeks now and am do delighted with the results. My skins looks brighter and feels amazing. Thank you the advice on product range. The Dermal Repair will complement my skin care routine and hope to be one of the lucky winners. Hello Joshna, thank you for letting us know that our service lived up to your expectations. We put a lot of effort and emphasis on our client relationships and interaction. We are just as happy to hear that you have experienced such great results in such a short amount of time. We wish you well with your entry!